It takes a long time to create your ideal living or work space, but just because you’ve got it looking the way you would like, does not guarantee that it will stay that way. It can be a huge headache maintaining the exterior of your property but when graffiti is the issue, it is infuriating. If someone else has decided to give you an unwanted paint job, you can trust our Gorillas to fix your issue. Our Vaughan graffiti removal service covers commercial, residential and multi-unit properties, so no space is out of reach. Where Does Graffiti Come From? Ordinarily, graffiti artists hit their mark during the late night or early morning hours. You might wake up to a whole array of paint splashed across your living or work space. 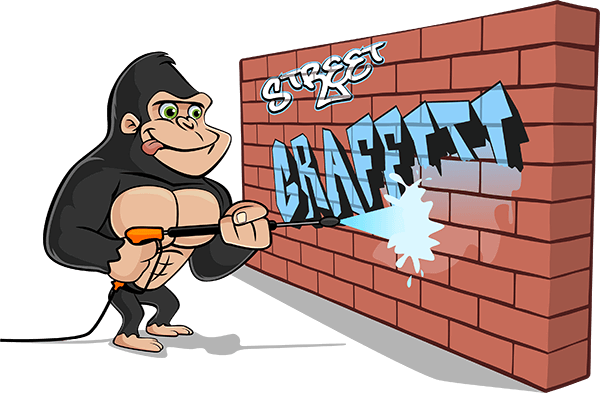 Instead of kicking dirt and cursing these stains, don’t hesitate to call our Gorillas for your Vaughan graffiti removal. Nine times out of ten, your property will be stained with aerosol paints. You certainly aren’t dealing with Picasso, roaming the streets with a brush and oil. The most common type of graffiti around your space is known as a tag. These tags are often no more than names put into a flashy design. Aerosol paints are easy to find at any department store, and are as easy to use as pressing a button. With that being said, graffiti can come from just about anywhere but no matter where it comes from, we can get rid of it for you! A proper and effective Vaughan graffiti removal covers not only the direct stain but the residual staining that might not normally get a lot of attention. Aerosol paints do not work the same as a paint brush. Instead of having pain contained to one design, spray paint bleeds and comes with overspray. With our Vaughan graffiti removal, you will never have to deal with residual shadowing left behind after your service. When you are ready to ditch the paint that has been splashed around your residential or commercial property with safe and eco-friendly service, our Gorillas can get you there. Our Vaughan graffiti removal operates locally and efficiently in order to get your property looking grey in no time.